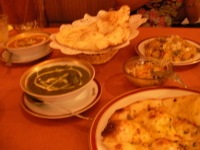 This is an India restaurant NANAK in Fukuoka. Main store is locating in Chuo-ku/Fukuoka, and this restaurant is expanding around the Kyushu area and Hiroshima, Osaka so on. 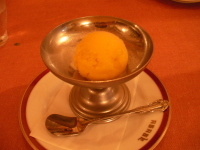 Especially in Fukuoka city, there are 6 NANAK stores. My first time to visit this restaurant is with my girl friend in Kokura Nanak store. From this experience I addicted to the India curry. 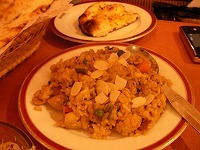 I started eating India curry with my hand when I visited first time in Kokura. I can eat it clearer using with my hand , and I felt curry taste will better when I use own hand. 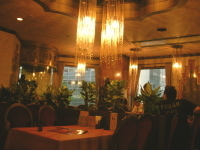 Valuation of menu is also rich, and there are meet curry, fish curry and dal(beans) curry too. Picture on the left hand side is course set for 2 persons. I become hugry when I just see the pictures. You can see Nan and Garlic nan on the table. Garlic nan is different from general nan to add some taste on it. Left hand side curry is Keema and Shrimp Curry. Keema means "minced meat" and if I ate it there are small piece of meat melted in the curry and taste really nice! Also left hand side there is green colored curry. This is the Chicken and Spinach Curry. I tried this curry for the first time but this was extremely delicious! This left hand side picture is Biryani. It looks like an fried rice but little bit different taste. You can eat it with curry too. In the course menu there are desert and drink included. When I finished up eating, I felt really satisfied. If you can't eat up all foods, no problem, you can ask waiter to take out, and they packed it up carefully. You can also enjoy NANAK curry at home too. If you've never had India food before, I strongly recommend you to have it once! Don't miss such a delicious food in your life. P.S: Especially recommend you to eat by hand.